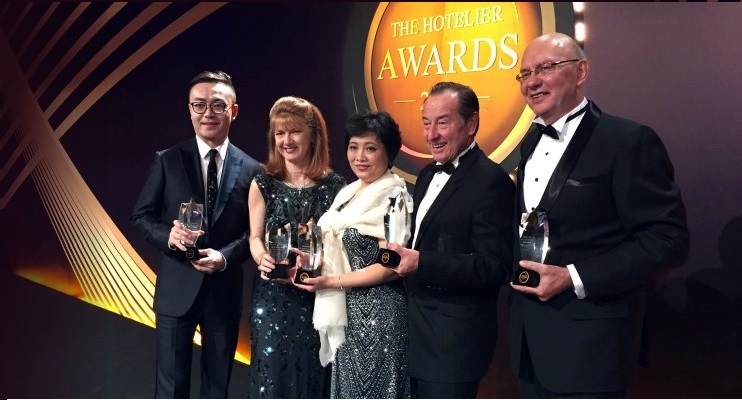 HONG KONG, 2016-Dec-28 — /Travel PR News/ — Niccolo & Marco Polo Hotels swept up the most awards of the night by any single hotel group, with 5 big wins at the industry’s most prestigious occasion, The BMW Hotelier Awards 2016. Dr. Jennifer Cronin, President, Niccolo & Marco Polo Hotels was awarded The Asia Pacific Corporate Hotelier of the Year for the Hong Kong-based international hotel group. Taking the awards by storm, the expanding hospitality group attended the impressive event recognising the industry’s finest talent and achievements. In the Greater China region, accolades were awarded to Sales Hotelier of the Year, Simon Wang, Director of Sales & Marketing for Niccolo Chengdu, CSR Hotelier of the Year, Rolf Jaeggi, Group Executive Chef, Marco Polo Hotels, and Owner Representative of the Year, Norma Yan, Owner Representative and Deputy General Manager, Marco Polo Shenzhen. Leading the ASEAN region in the category of General Manager of the Year, Frank Reichenbach, General Manager, Marco Polo Ortigas Manila, took home the coveted award recognising his efforts in hospitality excellence. On receiving the award, Dr. Cronin acknowledged the event’s co-masterminds, Stephane de Montgros & Benoit Thebaut for their vision in establishing these Awards, now in their third year. She also said, “The Awards have set a very high benchmark and they showcase the passion and professionalism of this vibrant industry”. She also encouraged the gathering of hospitality leaders to help each other grow and develop and never stop learning, so that we make the industry even greater for the next generation. Dr. Cronin was appointed President of Niccolo & Marco Polo Hotels in February 2016 after 30 years in the hospitality industry. A Doctorate of Philosophy graduate of Bond University, her admirable passion and strive for excellence allowed her to recently complete her PhD. Her sense of entrepreneurship and approach towards thought leadership has continuously driven her dedication to her profession. Within her achievements, Dr. Cronin launched new luxury brand, Niccolo Hotels in 2015 in Chengdu, and is tasked to open four new Niccolo hotels in the next 24 months including Chongqing, Changsha, Suzhou and the group’s new flagship, The Murray, a Niccolo Hotel in Hong Kong, next year. Through Mr. Wang’s solid client relationships and continuous team support, Mr. Wang has strongly positioned Niccolo Chengdu in the luxury market segment for the rapidly growing destination. Driving rooms business alongside events, restaurants and bars, he has explored new channels and built his network to promote the luxury hotel’s dining venues and drive sales for the region, whilst positioning the hotel as the epicentre for the city’s events. Chef Jaeggi began his culinary path in a small restaurant kitchen at the age of seven. Since then, his commitment to developing talent has forged projects such as the first Young Chef Culinary Competition for kitchen associates. Chef Jaeggi leads the group’s CSR “Project WeCan”, Marco Polo Hotels’ flagship business-in-community initiative, aimed at providing disadvantaged students with resources and care, to empower them to pursue promising careers. Ms. Yan has dedicated her career to drive business for over 30 years, including increasing the annual revenue by RMB 13.2 million for her hotel’s Japanese restaurant and significantly improving service standards and the restaurant’s reputation. Numerous accolades have been won under her leadership and recently completed a research paper on Young Generations in the Hotel Industry. Mr. Reichenbach, a seasoned hotelier with a career spanning over four decades, has continued to exceed expectations in operations for the group’s flagship hotel in the Philippines, leading it to have achieved multiple prestigious awards since opening in 2014. Under his leadership, the hotel increased its communication and media coverage 5-fold whilst improving both standards and service at the hotel, resulting in a 17% increase in RevPAR and 9% in food and beverage covers. The hotel is currently ranked as the top of 18 hotels in Pasig city, on TripAdvisor. More details about the winners are available at http://www.hotelierawards.com/awards-2016/winners/. This entry was posted in Hospitality, Hotels, Travel, Travel Awards, Travel Management, Travel Services and tagged Dr. Jennifer Cronin, Niccolo & Marco Polo Hotels, Rolf Jaeggi, Simon Wang, The BMW Hotelier Awards 2016. Bookmark the permalink.